Congratulations to the volunteer event organizers of our Annual Savannah T.E.A.L.® Walk from the Kappa Psi-Delta Omega Fraternity at the South University School of Pharmacy. 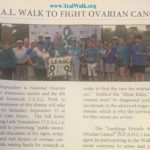 On September 16, 2016, two of these volunteers: Carina McCrea and Samantha Powell, received the Professional Fraternity Association’s Outstanding National Community Service Award for their hard work in spreading Ovarian Cancer awareness and fundraising for a cure. These students were specifically honored for their participation in Savannah’s 2015 T.E.A.L® Walk. 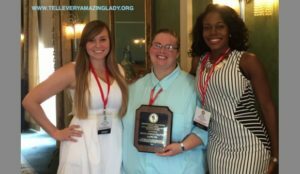 Doctor of pharmacy 2016 graduate and Kappa Psi member, Mandy Irvin spearheaded the inaugural Savannah T.E.A.L.® Walk event in 2014. 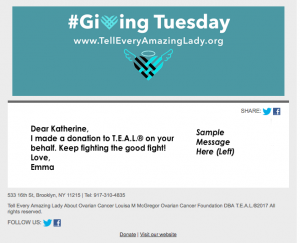 Inspired by her aunt’s battle with the disease and with the support of her fellow Kappa Psi members, Irvin raised four times the donations that her first event generated. All events included walk registrations, T-shirt sales, a silent auction and other events including health screenings provided by South University School of Pharmacy students and a donation of comfort care items for cancer patients donated by members of Kappa Psi. Congratulations ladies on your Amazing Award! 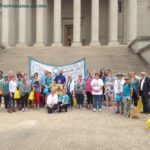 Learn more here and check out the our Savannah T.E.A.L.® Walk facebook page here.